M&T EXPO is the largest international trade fair for construction equipment and mining equipment in <?xml:namespace prefix = st1 ns = "urn:schemas-microsoft-com:office:smarttags" />South America. It was the first time for JCHI’s products to appear in this triennial exhibition. 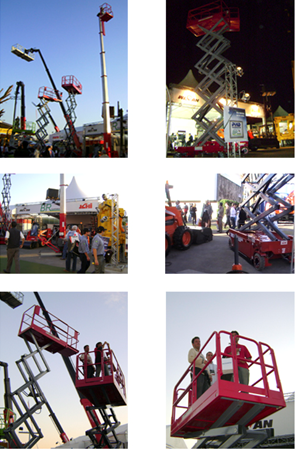 JCHI had three products (self-propelled scissor lift GTJZ10, manually-propelled scissor lift GTJY08 and sleeve mast aerial work platform GTWY12) displayed in this trade fair, which attracted extensive attention worldwide.